What Indiana Jones can teach us about Kun Tao. One of the most memorable scenes in Raiders of the Lost Ark is when a Really Big Guy with a really big sword steps out of the crowd to confront Indy. …and Indy just shoots him. No wasted time on a elaborate fight scene. Just take out the opponent quickly and efficiently. …and in a way that is completely outside their expectations of the situation. It’s what sets Kun Tao apart from traditional Kung Fu. Kun Tao doesn’t mess around with elaborate choreography they way traditional Kung Fu systems do. Kun Tao is the direct approach. 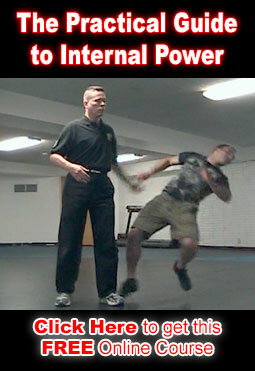 Explosive, Efficient, Effective self defense methods and training that is powerful and direct. Why waste time with anything else? p.s. I know many of you have experienced what I’m talking about first hand. So send me some of the craziest things you’ve heard from teachers who were trying to waste your time.